Tonight’s showdown is set, as Errol Spence Jr, Mikey Garcia, and the rest of the fighters made weight yesterday in Arlington, Texas, ahead of tonight’s big show at the AT&T Stadium in Arlington, Texas, home of the Dallas CowBoys. Spence (24-0, 21 KO) will defend the IBF welterweight title against Garcia (39-0, 30 KO), a four-division champion making his most dangerous and bold move up to date. 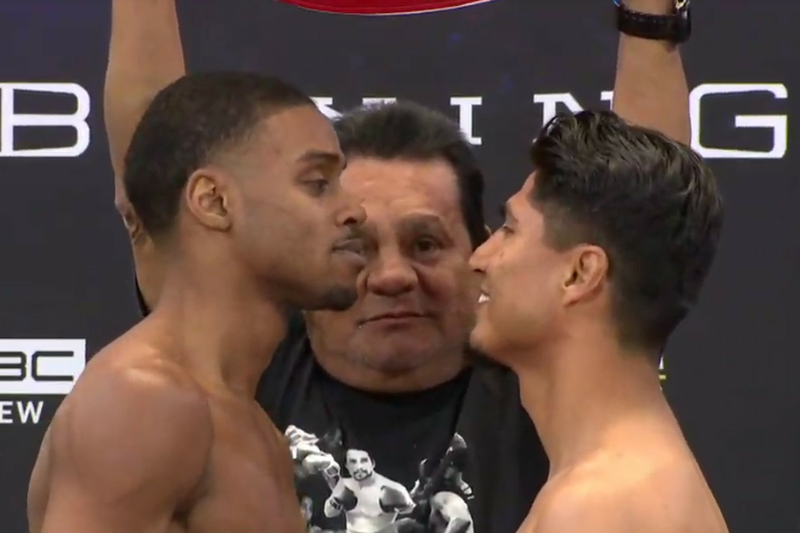 Spence weighed in at 146¼, with Garcia at 145½, both under the 147-pound limit. The three-fight pay-per-view undercard is also in good shape, led by the return of super middleweight David Benavidez (20-0, 17 KO) against J’Leon Love (24-2-1, 13 KO). Benavidez weighed in at 167, with Love at 168¼. Bantamweight star Luis Nery (28-0, 22 KO) is also in action, facing former super flyweight titleholder McJoe Arroyo (18-2, 8 KO). Nery, who has had weight troubles in the past, came in at the limit of 118, with Arroyo at 117¼. The pay-per-view opener will see popular veteran heavyweight Chris Arreola (37-5-1, 32 KO) back against Jean Pierre Augustin (17-0-1, 12 KO). Arreola weighed in at 239¼, almost six pounds lighter than he was for his December win over Maurenzo Smith, which was also Arreola’s first fight in about two-and-a-half years. Augustin weighed in at 226½. He wanted to take the scales with his shoes and pants on, because it doesn’t really matter, but organizers were very much against this.